Place each chicken breast half between 2 sheets of heavy-duty plastic wrap; flatten to 1/4-inch thickness, using a meat mallet or rolling pin. Dredge chicken in breadcrumbs. 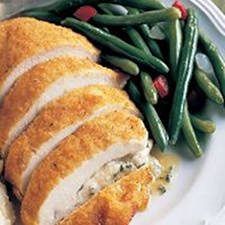 Spoon 1 tablespoon of cheese onto each piece of chicken, and fold chicken in half. Place folded breast halves in an 8-inch square baking dish coated with cooking spray. Drizzle butter over chicken. Bake at 400° for 25 minutes or until done. Per Serving (per 4 ounce prepared chicken breast): 229 Calories; 9g Fat (38.5% calories from fat); 27g Protein; 6g Carbohydrate; 1g Dietary Fiber; 88mg Cholesterol; 350mg Sodium. Exchanges: 1/2 Grain(Starch); 3 1/2 Lean Meat; 1 Fat.